Then carefully take the entire flower (meaning only all of the fabric petal layers) to your sewing machine, and zig-zag over the hole in the center, through all the layers of the flower. This will hold the petals in place and make the flower stronger. 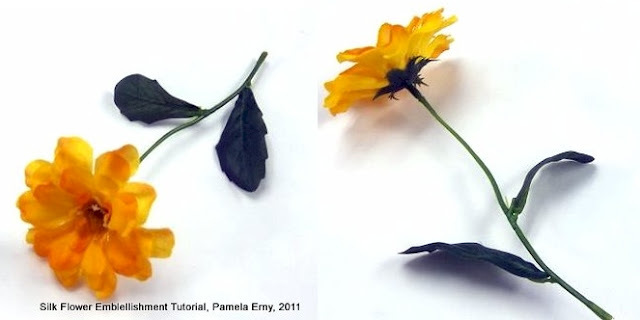 If you want to include the "leaves", position them under the flower layers before you zig-zag the center. Now all you need to do is position your "now-totally-washable" flower where you want it to be on your garment, and then stitch through the button (or bead) + all the flower layers + the garment layers. I use strong upholstery thread, but several strands of regular thread will work just fine. After stitching, apply a few drops of Fray-Block on your threaded button/bead both from the top-center, and the tied-off back side to strengthen it. Alternatively, you can make this embellishment removable by just stitching the button or bead through all the flower layers, tying it off in back, and then attaching the flower to the garment with a safety pin. I hope you will enjoy making your garments bloom! After I make a couple of new outfits for Julianna's little sister, it's back to shirt sewing full-time! I have some ideas for new shirt design details, and in the upcoming weeks I'll also be showing you some ways to make a regular shirt pattern into a slim-cut version. But first, I really MUST clean my sewing studio...I have been so lazy this summer! I swear, if I haven't touched it within 24 months (that sounds so much better than 2 years, doesn't it? )...anyway...fabric not touched within 24 months? Out it goes! As one of my Facebook friends asked recently, Do you ever feel that it will take nothing less than a bulldozer when it comes to clearing your sewing spaces? Or am I the only fabric hoarder collector out here ?